Need a weeknight meal that is hearty, filling and easy? 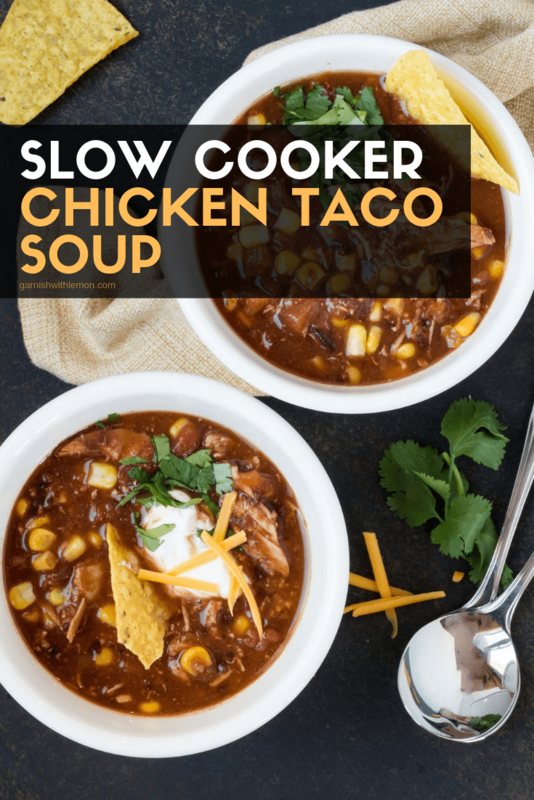 Slow Cooker Chicken Taco Soup is the answer! It’s a family favorite made with ingredients you probably already have in your pantry. Do you have the one meal that you can make your whole family happy? 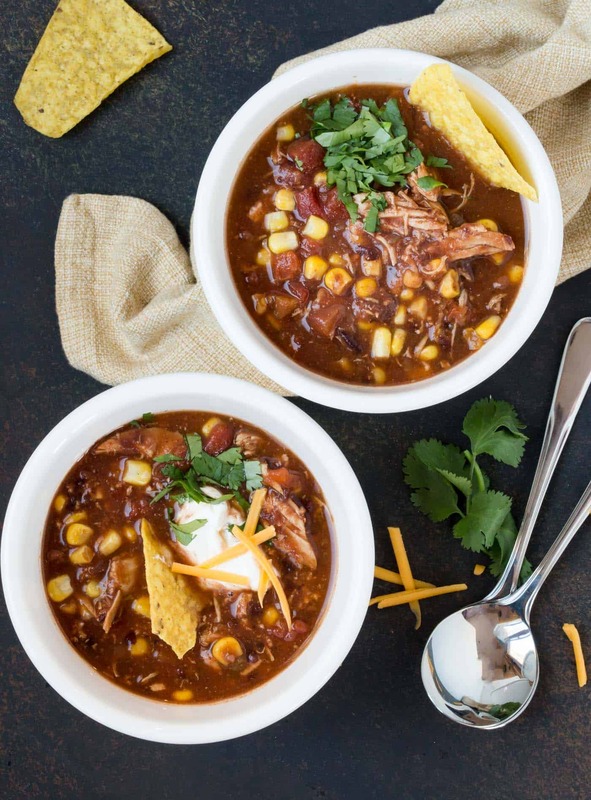 For us, it’s this Slow Cooker Chicken Taco Soup. Every single time I make it, I get a big thumbs-up when my family walks through the door. It’s even better that the only work required from me is to chop, dump and pour. Thanks to my slow cooker, dinner is ready seven hours later. My family is on to something here. What’s in the Chicken Taco Soup recipe? Slow Cooker Chicken Taco Soup is like a big taco in a bowl. Every bite is filled with tomatoes, chicken, cheese, refried beans and corn. It’s seasoned with taco seasoning and a bottle of beer (Don’t worry, all of the alcohol cooks off as it simmers and just leaves the delicious hoppy flavor behind. ), what’s not to love about that? What kind of beer do I use in the Chicken Taco Soup recipe? Feel free to use whatever beer you have in the fridge (that’s what I do) and if you want to omit it, just substitute some chicken broth. Tip: Forget to turn your slow cooker on? Use chopped, cooked chicken breast and cook on low for 2-3 hours. How do I garnish the Chicken Taco Soup? My kids’ favorite thing about this soup is they get to choose how they garnish it. We get out avocado, jalapenos, cheese, sour cream and fresh cilantro and they go to town. And my favorite thing goes without saying: Easy to make and the whole family loves it. Weeknight dinners don’t get much better than that. Make Ahead Tip: This soup freezes well. Make a double batch and freeze in individual portions. 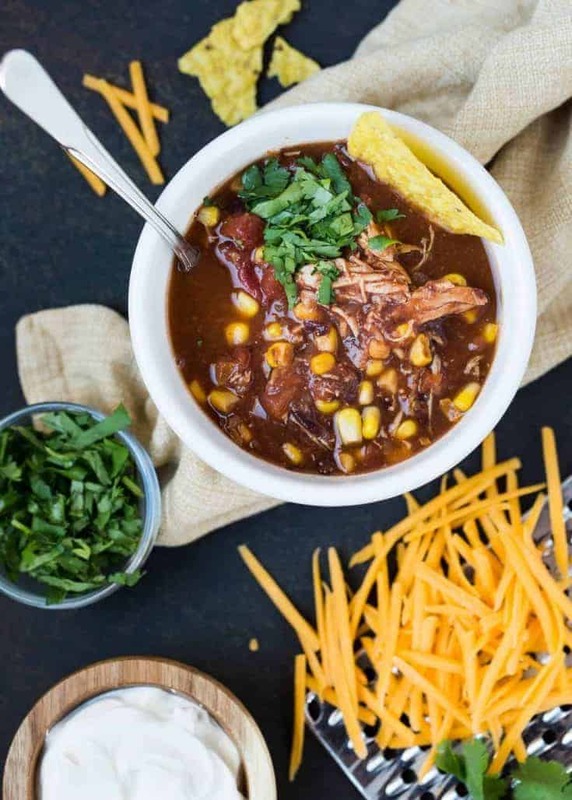 This easy Slow Cooker Chicken Taco Soup is made with pantry staples! Place the onion, black beans, corn, tomato sauce, beer, diced tomatoes, and chicken broth in a slow cooker. Add taco seasoning, and stir to blend. Lay chicken breasts on top of the mixture, pressing down slightly until just covered by the other ingredients. Set slow cooker for low heat, cover and cook for 5 hours. Remove chicken breasts from the soup and shred. Stir the shredded chicken back into the soup, and continue cooking for 2 hours. Garnish with shredded Cheddar cheese, a dollop of sour cream, cilantro and avocado, if desired. Thank you for the recipe. The ingredients list calls for refried beans but black beans are mentioned in the instructions. Just wanted to see which bean that you used. Thanks! Oops. I just saw that you listed refried black beans. I used the regular refried beans. Hopefully it will turn out as amazing as the one in the photo. This soup was a big hit! I substituted black beans for the refried. Delicious! Yay! I’m so glad you liked it. It’s one of our favorites! OMG, this is soooo good! I omitted the chicken, and added a 2nd can of black beans, to keep it vegetarian. I think the whole secret of the recipe is the beer, it just makes it so tasty! Thank you for sharing this recipe! Is there instructions on how to do it on high heat temp setting on the crock pot? You can cook it on high for 3 hours, that works too! Do you just use a bottle of lager like bud or something ? Hi Shauna, you can use whatever beer you like. Enjoy! OMG!!!!!!!!! Truly one of the best recipes I have ever made in my life!! I am not a big fan of veggies, and I can eat a whole big bowl of this without thought! A few changes I made because I forgot to buy some of the ingredients (and was in another PA snow storm), I mixed four tablespoons of tomato paste with chicken stock instead of tomato sauce, and I added celery/onions since I bought them prechopped! All in all, great easy recipe that everyone will love! I’m glad you were able to figure out a substitute in a pinch! This soup makes a regular appearance in my house too, so happy you like it!